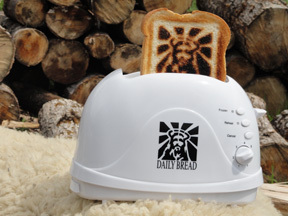 With the advent of the the Jesus Toaster, one need not wait patiently upon the inscrutable divine will for an apparition. One need only “press down the lever” to reliably re-produce the divine image and unleash salvific powers. This entry was posted in Kenny Paul Smith, Religion and Popular Culture and tagged Burnt Impressions, CNN, Jesus Toaster, Steve Walsh, Western esotericism, Wouter J Hanegraaf. Bookmark the permalink. Sure – but sooner or later somebody’s going to press down the lever on their Jesus toaster, and – after a minute or two – up will pop a Cylon.